Now that it's canning line is fully operational and the first two core tinnies are out and about, the Dainton brewers have been able to have a bit of fun. 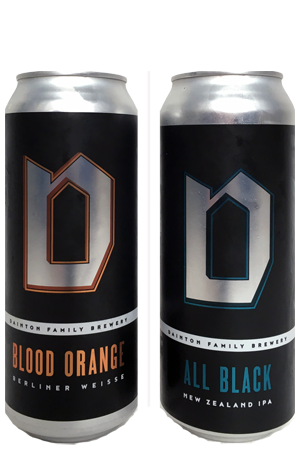 Fun in the form of 500ml cans filled with one-off releases, kicking off with this pair: the All Black New Zealand IPA and Blood Orange Berliner Weisse. The All Black appears to have been made to suit the look Dan and co has opted for with its limited releases: bold black livery with a silver "D" front and centre. And, while it might just state IPA in the title, it's a black IPA, or at least close to black. Aside from the nod to the Kiwi rugby team in the title, there's nothing but Kiwi hops involved. That said, the malts that contribute its full, thick body are as much to the fore, with the hops adding glimpses of herbs and spice alongside coffee, dark chocolate and a liquorice like sweetness that keeps perceived bitterness to a minimum. As for the Blood Orange, it makes Dainton the latest to enter the realm of Berliner Weisse and, with a head brewer in place who's brewed plenty in his time, it's a clean and cleansing affair: light and spritzy on the palate with soft orange characters melding with the gentle citric acidity. Certainly, if the All Black looks like it belongs in its can, this is more sheep in wolf's clothing.